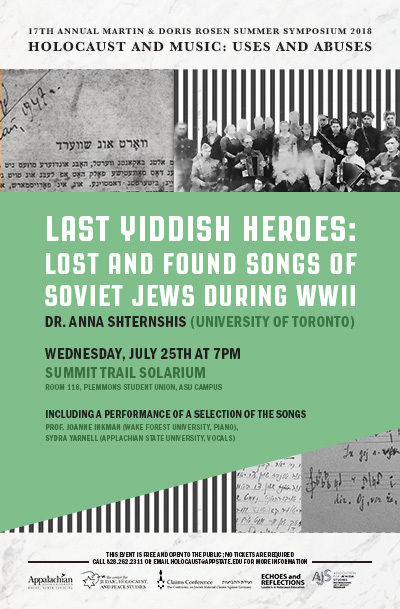 Appalachian State University’s Center for Judaic, Holocaust, and Peace Studies invites the public to a presentation by Prof. Anna Shternshis (University of Toronto) entitled “Last Yiddish Heroes: Lost And Found Songs of Soviet Jews During WW II.” It will take place at Summit Trail Solarium, Room 118, in ASU’s Plemmons Student Union (263 Locust Street) on Wednesday, July 25. The talk will begin at 7:00 pm. The program includes performances of selected songs such as “Der vekhter in di shtern” (Girls of Chuvashia) and “Ikh lig lebn pulyemyot” (My Machine Gun) by ASU student vocalist Sydra Yarnell accompanied by Wake Forest University pianist Prof. Joanne Inkman. After the collapse of the Soviet Union, librarians of the Vernadsky National Library of Ukraine discovered some unlabeled boxes that contained a collection of songs written by everyday Jews throughout the Soviet Union during the Second World War. In many cases, these were the first testimonies of German genocidal killings to emerge anywhere in Eastern Europe. The library staff worked with Prof. Shternshis, who did not only conduct research on the songs and their origin, but also began assembling a musical team to create “Yiddish Glory,” a now released recorded album of songs from the archive. Prof. Shternshis’ talk will shed light on the songs and their composers, demonstrating how the Jews in the USSR and Ukraine wrote their own songs influenced by their own culture, reflecting life in the Soviet Union and the atrocities of German occupation. Prof. Shternshis holds the position of Al and Malka Green Associate Professor of Yiddish studies and the acting director of the Anne Tanenbaum Centre for Jewish Studies at the University of Toronto. Born in Moscow, USSR, she received her doctoral degree (D.Phil) in Modern Languages and Literatures from Oxford University, UK, in 2001. Prof. Shternshis is the author of When Sonia Met Boris: An Oral History of Jewish Life under Stalin (New York: Oxford University Press in 2017) and Soviet and Kosher: Jewish Popular Culture in the Soviet Union, 1923 – 1939 (Bloomington: Indiana University Press, 2006). She also published over 20 articles on the Soviet Jews during World War II, Russian Jewish culture and post-Soviet Jewish diaspora. Shternshis serves a co-editor-in-chief of East European Jewish Affairs and a stand-in board member of Oxford Bibliographies Online in Jewish studies. The presentation and performance are part of the 17th Annual Martin and Doris Rosen Summer Symposium on Remembering the Holocaust that takes place from July 21 until 26, 2018, at Appalachian State University’s Plemmons Student Union and the Broyhill Music Center. This year’s symposium puts a particular emphasis on the role of music and its uses and abuses during this genocide. The event is organized by Appalachian’s Center for Judaic, Holocaust, and Peace Studies and named for symposium benefactors, the late Doris and Martin Rosen. The symposium is sponsored by The Conference on Jewish Material Claims Against Germany, the Martin and Doris Rosen Endowment, the Community Advisory Board of the Center for Judaic, Holocaust, and Peace Studies, Appalachian’s College of Arts and Sciences, the Hayes School of Music, the Boone Jewish Community/Temple of the High Country, Havurah of the High Country, the Ruth and Stan Etkin Symposium Scholars’ Fund, the Leon Levine Foundation, the North Carolina Council on the Holocaust, Echoes and Reflections of Yad Vashem (in collaboration with the USC Shoah Foundation and the Anti-Defamation League), and the AJS Distinguished Lectureship Program at the Association of for Jewish Studies. The presentation and performance are free and open to the public and no tickets are required. For a schedule of events and complete list of symposium speakers, please visit https://holocaust.appstate.edu/symposium.